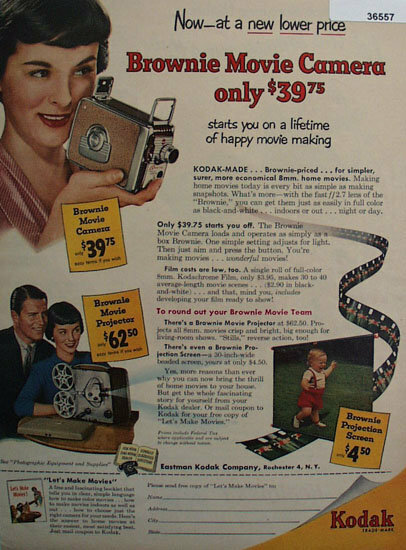 Kodak Brownie Movie Camera 1953 Ad. This color March, 1953 ad states Now at a new lower price Brownie Movie camera only 39 dollars and 75 cents starts you on a lifetime of happy movie making. Picture shows woman with Movie Camera taking Pictures. Also shows Man and woman showing Movies on Brownie movie Projector of baby walking. Magazine tear sheet picture is taken through plastic and may show wrinkles or crookedness that is not in the ad. This Original magazine tear sheet measures 8 inches wide by 11 inches tall. Items Similar To "Kodak Brownie Movie Camera 1953 Ad"